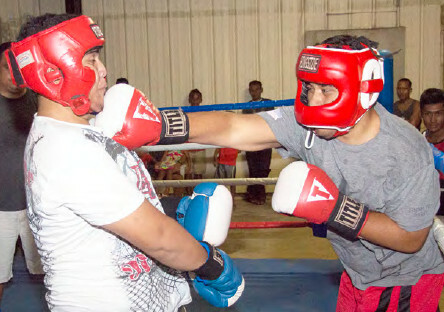 On September 11, 2015 the sport of boxing was introduced for the first time during the 36th Pohnpei Liberation Games at the Pohnpei Fitness Center. Jennifer Chieng's exciting and historic gold medal winning effort in the sport of boxing at the 2015 Pacific Games caused an explosion of interest in the sport from the public in the FSM, and the bouts were well attended even though the facility is still being remodeled. 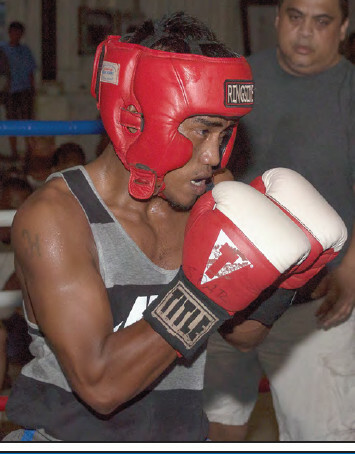 The Pohnpei Boxing Club held five exhibition matches. Young men hailing from the municipalities of Nett, Kolonia Town, Kitti and Sokehs fought matches of two, two minute rounds per match. The matches were carefully organized based on weight classes and on the experience of the boxers which varied from beginner to advanced. The safety and health of the boxers were the highest concerns for the event coordinators. The exhibition matches also followed the Amateur International Boxing Association (AIBA) Rules for Competition to ensure that the event was organized correctly and also to ensure the protection of the boxers. Furthermore, although the event was strictly an exhibition, three ringside judges were brought in to score each match based on AIBA's Scoring Rules and to declare winners in order to award a Gold or a Silver medal to each of the combatants. The judges were Jun Booth, Elina Paul and Memorina Sablan. The President of the Pohnpei Boxing Club, Kenneth Welles also took part in the exhibition as the referee for all five matches. The first bout was a welterweight match between Mark Abello Martinez of Nett vs. Harvin Bartolome of Nett. Both men did well in the first round, feeling each other out with sharp jabs and straight punches. Harvin Bartolome ended with a good flurry at the end of the first round. In the second round, Bartolome was able to let his hands go and put together crisp three punch combinations. Those combinations caused the Referee to give a couple of standing eight counts to Martinez to be certain that he could continue. Martinez showed a lot of heart and was able to continue until the end. Ultimately the judges awarded the victory to Bartolome. The second bout was a light heavyweight match between Nathaniel Nanpei of Kitti vs. John Joseph of Kolonia Town. Given the size difference from the first match, both men's pace was slower and more deliberate as they picked their shots at each other. Nanpei, with his height and reach advantage over Joseph was able to land more and cleaner blows than Joseph which factored into his victory. Both men admitted that they will need to improve their cardio-vascular health much more before they participate in another match. The third bout picked up the pace of the event. It was a light welterweight match between Kenneth Edmund from Nett vs. JT Edmund from Nett. Both men played a good game of human chess as they tried to counterpunch off each other's mistakes, but Kenneth's superior technique and defense allowed him to avoid and block more shots from JT and set him up for landing cleaner power punches that got the crowd excited. It got him the win. The fourth bout and co-main event was another light welterweight match between 2015 Pacific Games boxer, Royce Rott of Kolonia Town and Marvin Bartolome of Nett. The two boxers didn't disappoint and started their first round at a fast pace and ended up in a couple of wild flurries and exchanges that had the crowd yelling for more action. The second round was a repeat of the first with even more exchanges. Bartolome acted as the aggressor and Rott countered the exchanges. The fight could have gone either way but the Judges awarded the victory to Bartolome for showing more aggression. Finally, the highly anticipated main event middleweight match between 2015 Pacific Games boxer, Angelo Rodriquez of Nett and Endy Diopulos of Sokehs began. There was no "feeling out" process in this match and Rodriquez quickly asserted stiff jabs and a straight punch that backed Diopulos into the ropes with a split second opening. Diopulos countered with a straight right hand that landed cleanly on the chin of Rodriquez, knocking him down flat on his back. The crowd roared at the power of the counter punch from Diopulos and for a few seconds everyone wondered if Rodriquez would be able to recover or if he was knocked out. However, Rodriquez was amazingly able to get back on his feet and after a standing eight count said that he was ready to continue. Rodriquez came out of his corner, guns blazing seeking a knock down of his own. Diopulos and Rodriquez exchanged heavy shots with Rodriquez trying to impose his will and athleticism after clearing out the cobwebs from the knockdown. The entire crowd that filled the gym was in a frenzy, yelling and screaming to see these two warriors go another round. Rodriquez and Diopulos didn't disappoint and both came out of the second round seeking to land hard shots. The match had become a full fledged competition with both boxers holding nothing back on their power punches and trying to impose their will to get a definite win in the Judges' and crowd's eyes. Rodriquez, who was much calmer by the second round was back into boxing mode and was picking his shots and landing sharp jabs to set up his uppercut and left hooks between Diopulos' guard. The two got into more exchanges. Diopulos became winded while Rodriquez picked up steam to finish strong. It became apparent that there was something wrong with Diopulos. The referee stopped the match. Diopulos had re-torn his left rotor cuff and couldn't continue. Although it was a disappointing end for both boxers, the crowd loudly let the two combatants know that they appreciated the great show. The exhibition by the Pohnpei Boxing Club was a great success as it packed the Pohnpei Fitness Center and gave an entertaining and professionally run event. The organization is already preparing for a second "show" which will be a full three round, three minute competition this December. That will officially be the first boxing competition event governed by the rules of AIBA and will be called the "The Pounding on the Rock!". It will feature some of the boxers from the exhibition and most likely will be headlined by a rematch between Rodriquez and Diopulos. That event will be also be highly organized and will require all boxers to pass medical exams and to make the weight for their scheduled fights. Pohnpei Boxing Club wants to thank all the men that participated in this historic boxing exhibition match and all of the people that came to support the event and we look forward to putting on more exciting shows.